Pontius Pilate concluded his examination of Jesus with this brief question. . It was a response to Jesus' assertion: For this I was born, and for this I have come into the world, to bear witness to the truth. Every one who is of the truth hears my voice (John 18:37). Jesus did not answer. He appeared to ignore the question, standing silently. Then Pilate, instead of becoming angry, instead of rebuking Jesus and demanding an audible answer as he might normally have done, instead of commanding him to be punished, suddenly arose and went out to the accusing Jews who had brought Jesus before him and said, "I find no crime in him (John 18:38)." This was, to say the least, a very unusual response for a Roman governor. He had the power of life and death over this troublemaker who gave him no answer. How can we explain it? It seems there was an unspoken transaction between them during those brief moments. Jesus did not ignore Pilate's question but gave him the only appropriate answer by standing quietly before him. Pilate got the message: he was looking at the answer. The person standing before him was the Truth. Jesus stood as the Truth personified and Pilate knew it. He became very uncomfortable. He was the one under examination, Jesus was the judge! His discomfiture was immense and fear stabbed his heart. He wanted absolutely nothing more to do with this situation. He feared to harm this man, this Truth, yet he also feared the prospect of a riot should he not satisfy the accusing Jews. "Perhaps I can pacify them by scourging Jesus before I release him? A risky business, to be sure, but what else to do?" So he must have reasoned as he sought a way out of the dilemma in which he so unexpectedly found himself. Then they would understand the source of the inner drive that compels them to reach out into the darkness of the cosmos; then, beholding Him as the Truth, they would press on in the inspiration of the Spirit of God and of him who is the Light of the World; then, their quests would find fruition in the Absolute -- that is, in the metaphysical. The churchmen are not unlike Pilate. They, too, are compelled to confront Jesus. They, too, ask the question, "What is truth?" They, too, realize the same intense discomfiture while he stands, silently, before them. They fold the book and ponder, and, like Pilate, release him -- to be Crucified! The answer, they have not heard. Then, they proceed to apply to Truth a definition more to their liking and to impose it on the image of Jesus while He, as His Holy Word, stands silently. So the crucial question remains, both answered and unanswered, before them and before us all: What is Truth? For this I was born, and for this I have come into the world, to bear witness to the truth (John 18:37). But Pilate, uncomprehending, instead of hearing the answer, asked the question! The answer is the full body of the utterances of Jesus, the living Word, the living corpus of the Christ dwelling in the world, in the pages of the four gospels and in the hearts of the children of God. That, and only that, is the Truth! Every one who is of the truth hears my voice. Now I should define the question more precisely: What is the absolute truth? The word "absolute" is added because that is where we must start. That takes us to the bottom, to the root or foundation. Then perhaps we can begin to build understanding of the "truth" upward from that point. We have asked a question that is extremely focused, perhaps the most pointed question that it is possible to ask. We are looking for something where a telescope will be of no use to us. No, we must shorten its focus and use it as a microscope that, if possible, we may perceive the Truth, God's ultimate Truth, in its pure, point-like essence. Like Euclid, who realized that if he were to understand a triangle, he must first understand a line; and if he were to understand a line, he must first understand a point; and if he were to understand a point, he must realize the significance of a "given" and the limitations of human logic, which cannot go beyond the most elemental given concept. Next, I assure you that I recognise the temerity implicit in the asking this question. Nevertheless, I ask it honestly and seriously by recognizing that I must go immediately to the level of Euclid as he investigated the point. That is, I recognise that an answer, if it is to be forthcoming for me, must derive from a logical "given." It would constitute the ultimate presumption for me, or any other human being, to suppose that I, a simple human being, could ferret out absolute truth in the midst of my immersion in this sea of relativity, this conditionality, this world. I exist in the midst of an infinity of relativities, of conditions, of vicissitudes and changing circumstances, and I know no other existence. Therefore it is quite impossible that I should, in the resulting limited operation of my particular mental processes, transcend all these constraints so as to conceive, unaided, truth in the absolute. The same is true for you. That is why we need Jesus – must have him as the giver of the given – if there is to be any hope of conceiving the absolute. If we will fix our eyes and ears upon Jesus, he will provide the "given" with which we must begin. Likewise, I recognise that even if I should conceive of absolute truth, if I could look upon it and say truly, "this is the absolute truth," it would yet mean nothing, asbolutely nothing, to my life in this world, for it is irrelevant. You see, if it is absolute, then it must be unconnected to my life in the world or to the world. This must be understood, for if it has any connection to this world, then it must also have some connection to me, as a component of the world. The world is in this sense also your world, for we are connected within it. It then follows that neither can it, the absolute Truth, have any connection to you. It can have no connection or relevance to anyone whatsoever who is associated with this world. If it is really truth in the absolute that we seek, then it is irrelevant to any of us, that is, to our lives in the world! Only by conceiving it in this way can it be the absolute truth, for if it is in any way connected to the world, it becomes dependent upon the world. It would then be subject to change as the world changes; but it would not be absolute, for the absolute is the unchanging, the immutable. It must therefore lie completely outside the world and be also directly inacessible or directly unknowable. So, if we are to have access to it, the first view must come as a "given." We cannot seek it out, we cannot go to it. It must be revealed. It must come to us! This is of course the point at which an honest scientist loses interest. His entire craft is dedicated to seeking it out himself whereas the absolute comes only by looking and listening for the revelation. Now, the world is bounded by time and space, and contains matter and other forms of physical energy. These entities are constantly changing. Time is in constant flux in its seeming flight from the past to the future; space is continuously expanding according to Twentieth Century physics; energy is first one thing, then another, and we become conscious of it only as it changes – as, for example, when we take note of changes in the temperature of the room. Our bodies are but highly organized bundles of energy in its intensely compact, material form and we are conscious of daily changes. Our sensory equipment is limited to the detection and definition only of those entities conceived in terms of these "this world" realities. But the absolute Truth has no connection. Consequently, it must be neither physical nor temporal nor spatial as we conceive these things. It must lie completely hidden from us, outside of time and space and physical energy. Now, it is possible to conceive of the universe, this world, as contained within a sphere having its limits in some region where time ends, where space ends, and where matter and energy end. What, then, lies behind the extremity? There is no way for us, on our own, to answer this question for it is not possible that we conceive of any neighborhood were these fundamentals of the world are non existent. We can conceive of the limiting boundary, but not of the regions beyond. We are, in the world, like children who are sealed off from the world and reared within the confines of a chamber with no window and neither access nor egress, nor any communication to the outside (except through the person of Jesus), having no experience of any other world beyond the confines of the chamber. For such children, the realities of the other world are inconceivable, just as they are inconceivable to the babe yet in its mother's womb, lying as they do beyond its experience. The babe knows only the dark, silent world of the womb. So with the children sealed in a chamber. We are, to those children, irrelevant and unconnected. Insofar as the babe in the womb is concerned, we do not exist. Yet we do exist. To the children in the sealed chamber, our world has no existence. Yet it does exist. In Jesus, the Father has penetrated the barrier between time and eternity so to as bring light to the children. He has provided a door through the boundry of the universe, and with his entry he brought the "given," the absolute Truth that we could never, on our own, have guessed or imagined. And it is irrelevant! It has no connection to our spatio-temporal needs. There is no material benefit. It is foreign to our thinking, strange, unattractive. Who among us is drawn to the prospect of death by crucifixion? So it is truly written that he came into his own and his own received him not. Small wonder! Do you see what I mean when I say it is irrelevant? How is this going to help me balance my budget? How is this going to cure my frequent headaches? How is this going to save my marriage or my job? It isn't, because it represents the absolute Truth and as such it is and must be forever irrelevant to this world. What can be more irrelevant to life in the world than the hatred of life in the world for the sake of life eternal? Jesus came to bear witness to the Truth. He did not come into the world to help us win our wars, maintain our national freedom, restore prosperity to our homes, save our marriages, make our businesses successful, overcome our personal inadequacies, heal our illnesses, or promote our careers. Oh, he can do these things, and at times he does do them in order to catch our attention and to illustrate the quality of mercy; but they are irrelevant to him and to his absolute purpose in the world. Truly, truly, I say to you, you seek me, not because you saw signs, but because you ate your fill of the loaves. Do not labor for the food which perishes, but for the food which endures to eternal life, which the Son of Man will give to you; for on him has God the Father set his seal (John 6:25-27). The people were interested in the loaves. Jesus rebuked them because he perceived their interest was misplaced. They were seeking him because of the loaves that filled them, not for any interest in Truth. The loaves ministered to a temporal need, where relatives apply; Jesus' purpose was to minister to the eternal needs, where the absolute Truth applies. The churches of Christendom are making the same mistake: seeking to apply Jesus, who is Truth in the absolute, to the relative concerns of this life. Like that multitude, they seek the loaves rather than the bread of life. They are attempting to use him for their own ends. One church (Bellevue Baptist) erected a billboard on Interstate 40 East of Memphis, TN with precisely this misplaced emphasis. It proclaimed: "Jesus Heals – Broken homes, Broken Hearts, Broken Hopes." This proclaims to the world, falsely, that this is what Jesus is about, and it aims to attract to him, of course, those who sense intense needs in the areas indicated and who therefore come to him thinking of that as a goal and fruit of his ministry. Similarly, the invitation as presented by pastors and evangelists is usually misplaced. They tell you to come to Jesus that he may supply all your needs. Straighten out your life. Bring peace to your home. Deliver you from drugs. I could go on but these illustrate the level of the typical evangelical invitation. Then they get one thing right by also telling you that he wants to forgive your sins and save your soul for eternity. But are you really interested in that, when you have been attracted by the promise of the fulfillment of a temporal need? Hardly. Even if, in spite of the misplaced emphasis, you come seeking things eternal, you are unlikely to find them because of the false representation of Jesus that has been presented. This emphasis is, however, very successful from a worldly point of view. It builds huge churches, raises pastors to prominence and brings them large salaries and high respect from laypersons and their professional associates. It also packs the churches on Sunday morning with people who are utterly deceived as to the real character of Jesus. And as for the television audience, this invitation grabs them by the millions precisely because it is highly relevant to their temporal needs and therefore has absolutely nothing to do with Jesus. The result of all this is . . . well, look around you! Jesus is the Truth. His is the absolute Truth and as such he is absolutely inacessible and unfathomable to world-bound eyes. No initiative of ours could ever have reached him. It is his initiative that has reached out to us through the frontier of the universe and provided a door of accessibility. He did not come to fill us with the loaves, or to supply a temporal need; the Father has always done that, just as he feeds and has always fed the birds of the air. Then why should we bother with this Jesus and his Truth? The reality is that if we were perfectly fitted to this world of relativity, there would be no reason whatsoever to seek Jesus. If we were well matched to the temporal, we would have no need of the Eternal, of the Absolute. But we are grossly mismatched with our temporal environment. At our deepest level we are eternal beings, and apart from the treasures of Eternity, the absolute treasure, we can never be satisfied. It is no use, for however high we fly, however wise, wealthy and powerful we become, we are still empty of that which we most need. The Roman emperor, Lucius Septimius Severus, before his death in A.D. 211 said, "I have been everything, and it is worth nothing." (Durant, Will, Caesar and Christ, v. 3 of The Story of Civilization, p. 622; Simon and Schuster, N.Y. 1972). He but voiced the ultimate truth of the futility of this life and all it contains when it is lived for its own sake. There is a fundamental "core" deep within us that the temporal experience leaves unfulfilled, and when that is unsatisfied, nothing about us is satisfied. Therefore those who are wise seek this Truth, this Absolute Truth, because it alone meets our deepest, eternal need. So when I say it is irrelevant, I must be understood to mean only that it is irrelevant to our lives in time. It is highly relevant to each of us at the deepest level where, you may be surprised to hear, the irrelevant thing is life in this temporal world. Nevertheless, Jesus and his Truth remain totally irrelevant to time. Absolute Truth belongs to the realm of the Eternal, which is the metaphysical. The Eternal can have no relevance to time, which is the physical. It has therefore no relevance to our temporal existence. It is the truth, not of the circumstances of this life, but of the life that lies beyond this one. If we attempt a closer look at the eternal, we will see more clearly why it has no connection to our lives in this world. It has been suggested that we may approach it in either of two ways: as unending time or as timelessness. First, some look upon the eternal as unending time. So conceived, we need not think of it as radically different from familiar time in its essential nature. It flows just as time flows. There is of necessity a consciousness of time and its passage, with this one difference: it will never end. When this adjective, eternal, is applied to anything, it then says only that the thing must abide forever. Eternal life is then a life that never ends, that has no terminal "death." If we think about this carefully, we should begin to sense a problem. If it is really time, time that passes as it does in this world, it must rest fundamentally upon some type of change, for apart from change it seems impossible to conceive of time. How would it be measured? If there are changes, could not an end be one of the changes? If time as we know it is involved, there must certainly be an end of whatever is used to measure, or sense its passage – such as an hour, a day, a week, or a year. And if those things within this unending time have an end, perhaps the time itself is not without end? Change seems, then, to be an essential feature of time. Nevertheless, suppose we attempt to conceive of an unending time in which there are changes as necessary to supply its essential foundation. Then we must also apply this same feature to eternal life, or life in this unending time. This life would certainly be abundant life in the sense that there is an inexhaustible supply. But somehow I do not feel comfortable with this interpretation of the "more abundant" life that Jesus promised his followers. He referred to quality in addition to quanity. Then must the quality of life also be changing? What is to prevent it's changing from good to bad? But suppose that by some means beyond our comprehension time does move on endlessy yet without marking changes. Must we not then soon be bored, no matter what the quality of life in terms of outward circumstances? Such a boredom, without hope of change and therefore without hope of end, must certainly be considered as a fitting feature of hell. What greater torment than one such as this where, the longer it endures, the greater it becomes, and that without any hope or expectation of relief! So you see why I am wary of unending time. I do not say "No." to it, for who can say that such speculations are realistic when, to come by them, I must apply concepts learned by experience in this realm of a time that marks the end of everything? Then again, it has also been suggested that "eternal" means "timeless." Now, to be perfectly honest, I do not understand "timeless." Do you? If you say "Yes" I will contradict you, for I do not think it possible that we understand anything we have never experienced. The experience of time is constant and universal, and none of us is capable of framing a single thought or idea apart from a dependence upon it. Experiment. Attempt to frame a thought that has no reference to time. Such a thought will have a beginning, an end, and something in between, all referring to time. The in-between will most certainly have some reference to time also, apart from the beginning and the end. It will pertain to the past, the present, or the future, or have some reference to action, change or mutability. Change is the essence of time as I have suggested above, and time is the essence of change. I can conceive neither of time without changes, nor changes without time. Perhaps the closest we can get to "timelessness" is the experience of those who have suddenly and unexpectedly encountered an instant of extreme stress. Perhaps one who, riding in an automobile, suddenly perceived the immediacy of a life threatening accident and who, surviving, later said that "time stood still!" Perhaps we can say something about timelessness from the negative perspective, by suggesting what it is not? Since I cannot conceive of changes without time, it seems reasonable to say that, within timelessness, there is no change or variance. There is perfect constancy. There is no beginning or end. There is no memory, and no prophecy, where there is no past and no future, but only an everlasting "now." Perhaps in Eternity there is something other than time that nevertheless provides a sense of change. Deep within I seem to sense ideas about Eternity, yet I can frame no certain statements. I can only say what I like to think. I like to think that Eternity is a realm without change, where everyone and everything is perfectly dependable. I like to think of it as without end. I like to think of it as foundational to all things, including the temporal. Every such thought is, however, of necessity a matter of pure faith. Not having the experience of Eternity, I cannot speak with authority about its timelessness, although I do believe that it is more accurately described as timelessness than as time without end. I mean timeless as we experience and comprehend time. There may very well exist in the realm of the Eternal a variety of time, absolute time, of which we have no conception. If babes in the womb could think and speak, would they have any basis whatsoever for accurately describing the world into which they are about to be born? I think not; nor do we have any basis for describing the life eternal other than those features announced by the Eternal One who invaded the realm of time precisely to reclaim time's captives and to release them from its futile characteristics. Finally, Eternity, if timeless, must also be spaceless, for these two concepts are linked inseparably. So, we cannot even conceive ourselves as being inside the sealed chamber of this world and the Eternal being outside. The Eternal may be everywhere present, knowing no spatial distinctions whatsoever. This, for a change, is not difficult to conceptualize by using scientific examples. Our race existed for many millenia in the midst of all kinds of electromagnetism with no consciousness of any of it except for one variety – light. Magnetic fields, gamma rays, infra red and X-ray emanations from outer space, the spray of fundamental particles known as nutrinos and all such things were no less present 1000 years ago than today, but our ancestors were utterly unaware of them. They simply did not have the sensory equipment required to conceive of such things continuously penetrating their bodies, their "space." Now, after the invention of instruments that convert these things into effects detectable by our senses, we are assured that they are here, surrounding and permeating us – but we still cannot see them. We can only see their effects in special equipment invented for that purpose. Can the Eternal be similarly positioned? Can electromagnetism itself be a manifestation of the Eternal? You see how, like the curious cat drawn to its doom, we wander hopelessly astray with speculation when we attempt to define Truth and things that pertain to it, i.e., eternal life and every aspect of the Blessed Hope of mankind? We really can say nothing about it with any assurance whatsoever. We can only sense the deep need of it, and by some means seek a "given" that provides some grounds of assurance that our sensitivities for the Eternal are not misplaced. Jesus's words constitute the "given" revelation of Truth. It is from them we must learn all that can be understood about the Eternal. We must go with faith, not knowledge; with personal rather than mathematical relationships. The diagram presented below represents some of these ideas. I present it in order to demonstrate, graphically, that it is not unreasonable to see these kinds of relationships between our world, mired in relative conception, and Eternity, which is the realm of the Absolute. Such conceptions come to me as I ponder the words of Jesus, and these thoughts suggest strongly that the message of Jesus is perfectly consistent with the reality of which we are a part. Good science and good religion are intimate partners in the quest for understanding the human experience. that, as indicated by the arrows, continuously flows to the right. This is, then, the direction of the flow of time; it can move in no other direction. Also, consider that the time T1 is the present, so that the line to the right of T1 has not yet been generated; it only represents the future as time moves from the present toward future times. If you or I were positioned at P1, and if we could see time, we would at first see only the single point-like object, the instantaneous time T0. Then as time passes we would see the line T0T1 advance with time from T0 toward T1. Now, switch to the overall perspective. I must emphasize to the reader that this diagram must be seen in three dimensions if it is to make sense to you. Note the heavy line, T0T0', that stretches along the Z axis, which extends into the third dimension. This line has a dual significance. It represents either space or free will depending on our needs. As the time progresses to the right, along the X axis, this line proceeds with it, for time is also inseparably bound to this line as well as to the time line. As the space/freewill line proceeds with time to the right, it marks out a plane surface, such as T0T1T1'T0'. This plane, in its totality, represents the world, the world that in reality exists only at the time that is "present." The line proceeding from the origin at T0 is representative of the instant in time, T0, that marks the beginning of the world, that is, of space and time. It is the first instant of created time, and marks the beginning of the "Big Bang." Specify that T1 represents the present time. Then the line T1T1' represents the present position of the space/freewill line. It marks the locations of all events and all points in space at the time T1. In the plane surface to the left is the totality of the past of the world, containing all events in the history of the world. In the plane to the right is the totality of the future of the world, containing all events that are yet to exist in the world. The line, T0'TC' represents the boundary of space. It is shown parallel to the Time Line to facilitate representation of the other entities, but to truly represent reality it should be slanted with its beginning at T0. Its inclinition in that case represents the expansion of space with time. The length of the line, T1T1' therefore represents the size, spatially, of the world (cosmos) at the Present Time, T1. An "event" is here given a very general definition. It is any real entity whatsoever. It may be a "person" event, it may be an "action" event, it may be a "decision" event, it may be a "material" event. Anything that has a time can be an event. You and I are events, by this definition, and our present positions in time and space are represented by the points Y1 and M1. Note also, at this point, that time progresses along the Time Line to a final point TC, which is the instant of the end of the world that, in totality, is represented by the Space/Freewill line TCTC'. Now, to expand this definition to meet our immediate needs, I should also say that this line, TCTC' can in addition be representative of the instant of time, TC, defined as the point of death of any person, since the point of my death is also the effective end of the world in so far as I am concerned. Your time of death would almost certainly be at a different time, and is not represented in the diagram unless one wants to define the point TC as a general time that, diagrametically, represents the time of death of any person. So, you see, the experience of death is both the end of the world for the individual, and also the only exit from the world plane into the realm of Eternity. Now go back to the present time line T1T1' and locate "you" at the point Y1 in the present. This line is called a Space Line because space is needed, both in reality and in the diagram, to contain or represent the events occuring in the world at time T1. Now you are about to learn why it is also called a free will line, for you are, at the present moment, making a decision that will, depending on your choice of options, take you either to point D1 or to point D2 as time progresses. This is a choice that you make "of your own free will." Your decision is a real event, and thus falls within the "event" definition. This decision can be any decision whatsoever within the realm of possibility, but for ease of illustration let us suppose that it is a decision to take a journey, and you decide to proceed from Y1 to D1. The line Y1D1 with its direction only indicates your choice of an option. It does not necessarily represent a direction in space unless a direction in space was your choice, which it is in this case. If I, located in the present time on the space/free will line at point M1, at the same instant T1, also decide to meet you at D1, that would set up another line of choice, M1D1. In that case, D1 comes to represent the point, in space and time, of our meeting at some future time. Now observe that there are certain limitations. We can never choose an option that effects the past; no line of choice is therefore ever directed to the left of the present time line, T1T1'. The laws of physics compel such lines to move to the right in the general direction of the flow of time, into the future. Also, there is no possibility, within time, for an event, any event, to escape the world plane by, for example, moving off into Eternity the direction of the line E1E2 parallel to the Y axis, or in any other direction that would remove it from the world plane. These are the space/time constraints that bind us all for so long as we live in this world. Therefore, any space outside this plane – above, below, before, after, anywhere – is inacessible to us for so long as we are confined in the world plane. Before you jump to conclusions, I should also state that it does not follow that there is no reality outside the plane, or that it is not significant to us. Consequently, let all the surroundings of the plane, in which the plane is totally immersed, be given a name of its own, and be considered to have a reality vital to our interest, although inacessible to us. Let us call it "Eternity." This entity is locally represented by the Y axis. Also, note that I did not use the word "space" above, but rather "surroundings" to indicate that this is only representative of a special state of being that is outside of space as we know it, and therefore is unfathonable to us. The "Eternal" is a special state of reality that is unqualified by either space or time, that is, by spacetime. Both our space and time, as well as ourselves, are confined to the time-space/free will plane that is the totality of the world. A person located at point E on the present time line, T1T1', can also make decisions as you and I did when we decided to move to point D1'. That would be an event. That person may also die. That would also be an event. In that case, that person does not remain in the World Plane, but moves off into Eternity, as represented by the Eternity Line E1E2. This is the only event that can remove one from the World Plane, or from the world. Now you are about to learn why I also term the line T1T1' the "Free Will Line." I have stated above that an event can be a decision. Now, if one's decision is to hate one's life in the world for the sake of life eternal (The Great Principle) , then one has in effect attached one's heart to the Father and His Eternal Kingdom. The Father accepts this decision, made out of love for him and as a follower of his Son our Lord, as our free will desire to be with him. This has the effect of liberating our hearts from the World Plane. The Father then accepts us into Eternity, provided only that our decision a genuine one of free will. The Father may keep us in the world for a time, to prove our faith and witness to others, but the real point of death to this world came at E1. The upward arrow from E1 to E2 can be seen also to represent an ascent into the Eternal in the direction of Heaven. The downward arrow to E3 then represents descent into Hell. The only ascent must come through the Great Principle. All other deaths result in descents rather than ascents, although all move us out of the World Plane into Eternity. I do not discuss the further significance of free will in this paper. That will come in a later paper on this site. 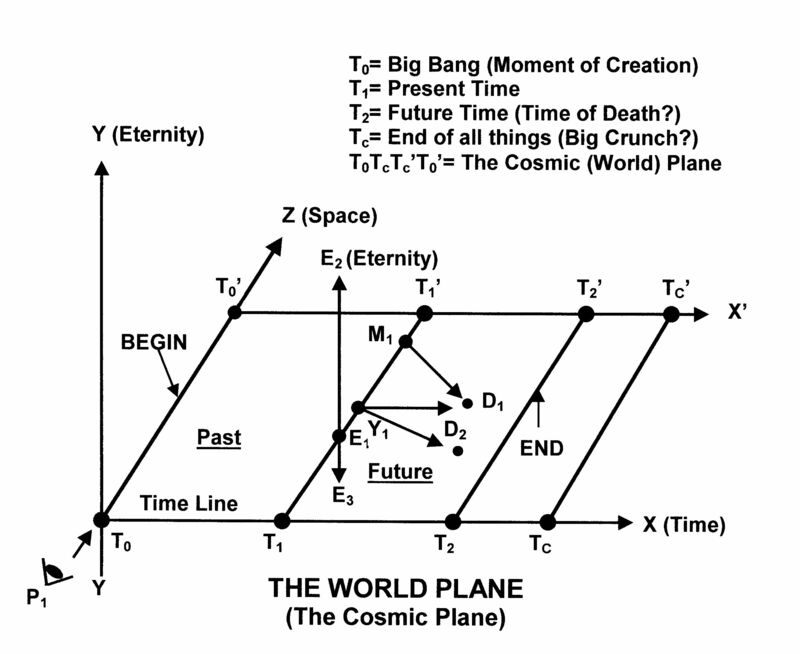 Briefly summarising, the co-ordinate axes X, Y, and Z represent, respectively, time, space/freewill, and eternity. Recalling that a plane surface has no depth in reality, but as represented here it has only two dimensions, we see that the world plane takes away nothing from Eternity, but rather, it is only embedded in the large "surroundings" that is the vastness of Eternity that surrounds and permeates it. It is in this large volume that the "Absolute Truth" is rooted and defined. That is why it is inacessible to us, excepting only as it is injected from outside, for we have no means, save death, of breaching our confinements so as to behold it. But we are confined to the world plane, with absolutley no sensory equipment to detect anything outside it. Yet the essence of our being in the "inner person" is eternal, and drives us to seek release from the World Plane; we can never be truly happy there (here), never truly satisfied in time, never permanently gratified by temporal treasures. Being ignorant of the reality outside the world plane, we are afraid – afraid to venture out, afraid to put our trust in the unknown, afraid to live by faith, and afraid to die. The fear of death therefore becomes the seal of our confinement. Like a person afflicted by both agoraphobia and claustrophobia (terrible condition! ), we are at once afraid of the "open spaces" of Eternity, and desperately unhappy with the confinement in the world. It is from this terrible dilemma that Jesus would set us free, by the revelation of the Absolute Truth that we could never, of ourselves, conceive. He is able to do this because he came to us from out of Eternity, into our World Plane where he suffered for us in order that he might deliver us into the glorious freedom of the Eternal Kingdom. We manifest this freedom, first of all, by overcoming the fear of death. Then we are no more bound, in our free will, to the confines of the world plane. It is now possible for any one, any where, any time, to make a decision to follow him, a decision that moves us, in our hearts, out of the world plane in the direction of the Eternity Line, E1E2, where we have attached our hearts to eternal treasure, that is, to the Eternal Father so that we can truly say that we hate our lives in this world. Conclusion -- the Axioms of the "Given"
I. THE FIRST COMMANDMENT: Thou shalt love the Lord thy God with all your heart and with all your soul and with all your strength and with all your mind. The first derivative: Call no man your father on the earth. The second deritive: Whoever loves his life loses it. II. THE SECOND COMMANDMENT: You shall love your neighbor as yourself. The first derivative: You shall love yourself . The second derivative: You shall love your enemy. III. THE FIRST RELATION: You have one Father who is in heaven. The first derivitive: Except a man . . . hate his father, . . . he cannot be my disciple. The second derivitive: Do not set your affections on earthly relatives. this world will keep it for life eternal. The first derivitive: Whoever would save his life will lose it. The second derivitive: If any man would come after me, let him take up his cross and follow me.